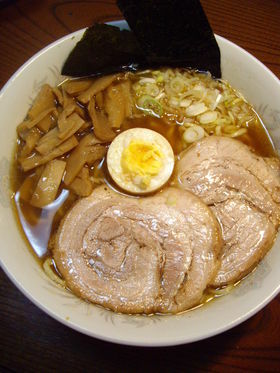 The following ramen recipe is complete but basic and can be improved on with many variations and other ingredients. It originally comes from Saitama prefecture, just morth of Tokyo. -Boiled egg, chopped leeks, nori seaweed, etc. Konbu and dashi sold in Japanese supermarkets. Packed boiled menma sold in Jpanese supermarkets. Keep in mind that such ramen take two day to prepare! Wash the blood off the chicken carcass and pork bones with clear cold water. Break the pork bones in two. Holding the pork feet with tongs, burn the hair away over a gas flame. Clean with clear cold water. Roll thepork belly cut with the thinner part inside. Secure it by binding it tightly in cooking rope/thread. Do the same with the chicken breast if you use them. Wash vegetables and cut roughly. In a large enough (7~10 l) pot, pour plenty of water and boil the pork bones inside over a strong fire. Skim off the water regularly of all unwanted matters. When unwanted matters have stopped appearing, add chicken carcass, pork belly, pig feet/trotters and boil over a medium high fire, skimming off all unwanted matters regularly until they stop appearing. Add vegetables and seasoning and simmer over a medium high fire for 2 hours. Take out pork abelly (and chicken if used) out of the pot and simmer it in the Chashyu/Char siu sauce for 2 hours. Take out all solid ingredients out of the Japanese base soup stock pan. Take 300 ml out of it into a separate bowl. Add the other ingredients (-Konbu, dried shiitake, Japanese sake, Mirin/sweet sake, iriko/small dry fish, Kongoukezuribushi or Niboshi dashi/dry sardines shavings for stock, Soy sauce, Salt, Hana katsuo/large bonito shavings) and 150 ml of the Chashyu/Char siu sauce. Bring the soup left after cooking the chashyu/Cahar siu to boil. Add the rest of the Japanese base soup stock and cook over a low fire for 2 hours. This will be your basic soup. Prepare noodles bymixin the ingredients as you would do with pasta. Cut the noodles with a pasta machine to 2×2 mm and let rest inside fridge. Boil the menma for a little while. Pour the sesame oil in a frying pan. Lightly fry menma and chili pepper. Add other ingredients. Keep frying until juices have reduced to about 2 tablespoons. Transfer into a bowl. Let cool completely. Keep in fridge. The proportions for the soup and shoyu dare should be of 360~400 ml of soup for 35~50 ml of shoyu dare. Adjust to taste. After having chilled the chashyu/char siu well cut ino slices of the thickness of your preference. Heat large serving bowl in hot water. Boil the noodles in a large pot for 4~5 minutes. While you boil the noodles, throw hot water out of the serving bowl. Pour shoyu dare then the soup. Drain the noodles and drop them in the soup. Place chashyu/char siu, boiled eggs, chopped leeks and nori on top and serve! The noodles according to this recipe should have enough “bite” to them while blending well with the soup! is this ramen bar recipe or just home cook recipe?? ?